Today we deal a lot with PDF files - invoices, contracts, bills have gone paperless. The more PDF files we have, the more sophisticated tools we need to process them. The free Acrobat helps us to open PDFs, but when it comes to deleting blank pages, splitting or combining pdf pages, converting to other formats, or creating full reports about PDF files, it is useless. CoolUtils offers 6 programs that will help you to optimize your PDF file in all possible ways. Take a look at Coolutils programs and find an efficient solution to all PDF-related problems. These little helpers will convert PDF files, split them into parts, extract blank pages from scanned PDF documents, print them in batch and do a lot more! Convert PDF to DOC, TIFF, TXT, XLS, etc. It is possible to render only text or only images from original PDF docs. This helps to focus on the data type you're interested in. There is also an option to convert to PDF. This helps to compress original PDFs, extract ODD or EVEN pages, or even some page range. You can also combine pages of a few PDF files into one. The prices start from $49.90 for a life-time license; the trial version is full functional and valid for 30 days. Extracting only odd or only even pages. You can also combine PDF pages into one document: the program will create a new document for each group of pages (the number of pages per file is specified in settings wizard). Processed PDF files can be encrypted with two passwords (user and admin), and you can limit permissions in settings. Signing output PDF files with a digital signature is also available. PDF Splitter is priced at $59.90. Users are welcome to download the evaluation version first. If you need an opposite effect, to combine a few PDF files into one, use PDF Combine. It is specifically created for merging a few PDF files into one and adjusting its formatting. You can process many folders with PDF files at once, and the program can either combine all PDFs into one, divide files by folders or common name part. Formatting options include bookmarks creation, adding texts into header and footer, font styling adjustments, password protection and signing with a digital signature. Additionally PDF Combine can generate a report about selected PDFs. You can view all PDF files inside the program, as a PDF reader is built-in. PDF Combine can be purchased for $59.90. Please, download the trial version first to test th eprogram on your PDF files. Note that PDF Combine Pro supports more input formats, helping to combine TXT, RTF, XLS, DOC, TIFF and JPEG files into PDF. 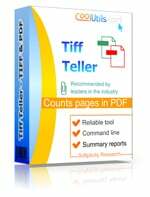 Tiff Teller knows everything about your PDF and TIFF files and shows statistics about them in a table view. Additionally you save the report in numerous formats, including CSV, DOC, XML, RTF, HTML, MS Access. The program shows information like date of creation, number of pages, size, the date of last edit and other items about PDF files from the selected folder. There are 17 parameters in total, and user can select which ones to show in the report. Some custom reports like "show the size of the first page in every PDF file" are also available. Additionally, you can move or copy PDF files from one folder to another and to print the report on the go. Tiff Teller is quite cheap, it's only $27.50 for a life license. The free evaluation version is available here. Scanned PDF files often contain blank pages that usually separate one document from another or were generated by scanning software by mistake. 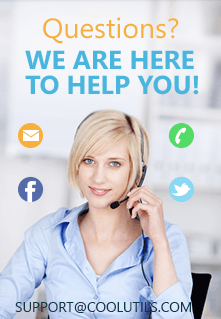 Tiff Pdf Cleaner takes them away providing user with clean PDF documents. User adjusts the workspace by setting the borders in pixels. The program will analyze this page area with a preset tolerance. To avoid any data loss, all pages recognized by Tiff Pdf Cleaner as 'blank' can be saved to a separate file. User will be able to make sure that only blank pages were removed from original PDFs. Tiff Pdf Cleaner also allows splitting PDF files by blank pages. This means that the fragments of original PDF files separated by blank pages will be exported to separate PDF documents. This is a batch PDF processor that can clean all PDF files at ones for saving maximum of your time. The price is $59.90 while the trial version is free. Total PDF Printer is a simple but very efficient printing utility for PDF files. It will help to optimize PDF originals for printing and manage printing on different printers connected to a computer. It processes files in batch and offers lots of setting for that. For example, it has fit-to-page option or scaling if your PDF files are all different. Users may set printing quality from hight to draft to save ink. Total PDF Printer supports duplex printing mode. Desides, it can add a separator page to divide printed documents in tray. The settings can be done once for all PDF documents you need to print. This allows printing all same-type documents quickly. Total PDF Printer costs $49.90 for a personal llicense and is available in the evaluation version for free. These 6 PDF processing tools are available in one bundle, at $99. This low-cost offer helps to save almost $300 compared with the purchase of the same 6 programs separately. This is all you need for processing and managing PDF files efficiently.